AquaQuest is a purpose built dive and snorkel vessel that explores the Great Barrier Reef, visiting amazing dive sites and offering an unforgettable experience. Departing from Port Douglas, AquaQuest visits two exclusive dive sites during her one day trip, where both scuba divers and snorkellers can explore the reef at length. AquaQuest is the newest vessel departing from Port Douglas, providing guests with unrivaled comfort and experience. Operating for more than 40 years in the region, guests can rest assured they are in safe and experienced hands while exploring the Great Barrier Reef during this full day trip. With Agincourt Reef, Opal Reef and St. Crispin's Reef on the agenda, divers and snorkellers can expect to experience superb diving, amazing snorkelling and an overall unforgettable experience. Guests who want to enjoy snorkelling during their time on AquaQuest will be shown the best places to snorkel and what they can find there by their knowledgeable crew. 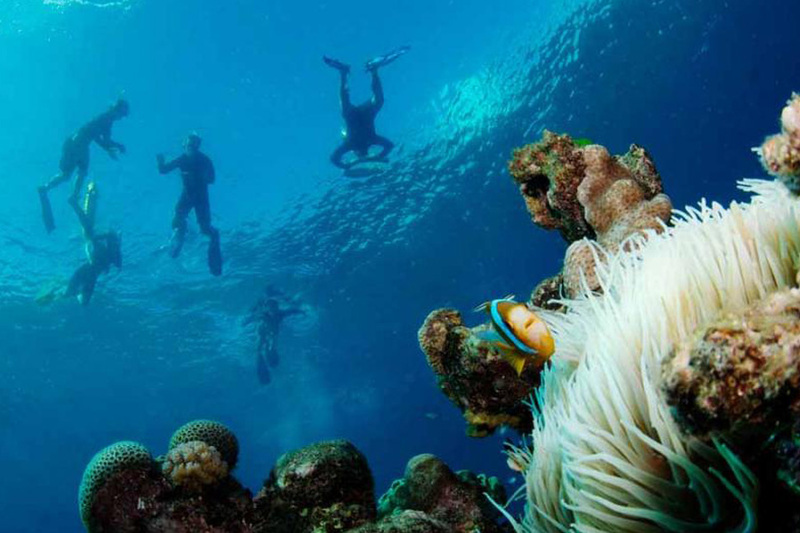 With 3 opportunities to jump in the water to explore, there is much to be seen on the Outer Great Barrier Reef, including tropical fish, colourful corals, stingrays, sea stars and more! AquaQuest offers diving to both introductory and certified divers, visiting 2 different reef sites during the day for up to 3 dives. Introductory divers require no experience as long as they can swim, and will be given a thorough briefing before taking to the water. Diving up to 12m alongside your guide, you will get to see the abundance of marine life that waits below, including thousands of species of fish, shy reef sharks, amazing plant life and so much more. Certified divers can dive with a buddy or ask one of the friendly crew to dive with them on a shared guided dive at no extra cost. Nitrox fills and courses also available. Book now for your chance to explore two exclusive locations on the Great Barrier Reef for a day or snorkelling, diving and exploring. CERTIFIED DIVERS - Please remember to bring your dive card. If you do not you may be required to sign a 'Statutory Declaration' and dive with an Instructor on your first dive which will cost an extra $15.00. T-shirts, hats, snacks, soft drink and alcoholic beverages are also available for purchase on board. If any of these conditions apply to you, you may require a Divers Medical Certificate before you can scuba dive. Departs: Port Douglas. Open date tickets (subject to availability) please give 7 days notice to book Ph: 07 4099 6419 or from outside AU: +61 7 4099 6419. All client cancellations forfeit 25% of total ticket price and all client cancellations made less than 21 days prior to departure will result in complete forfeiture of the full price of the trip. If the company has to cancel the trip (prior to departure) and we cannot offer a suitable alternative, then a refund will be given minus card fees. We strongly recommend that you have travel insurance, especially during the wet season.